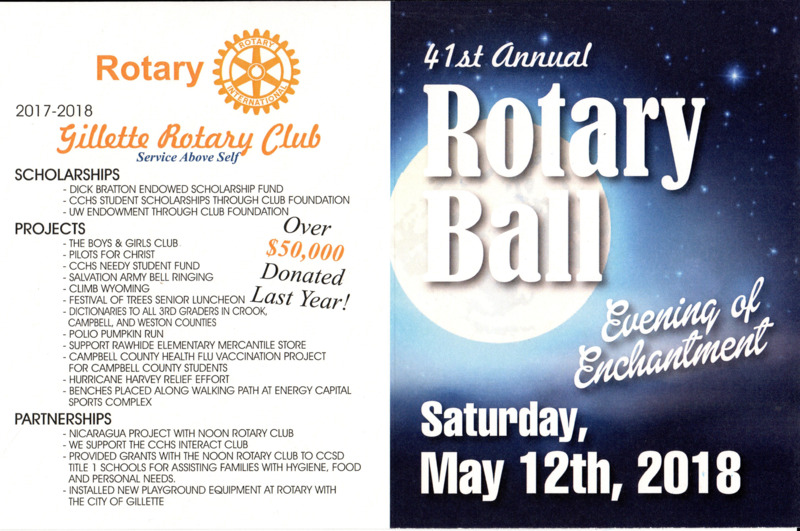 Join us at the 41ST Annual Rotary Ball May 12, 2018. This is our Ruby year and the theme is "Evening of Enchantment". This year we will be rocking with the band THE SALAMANDERS. 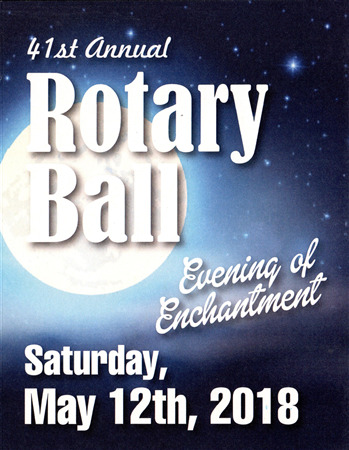 The Rotary Ball is the annual fundraiser for the Gillette Rotary Club. Last year we were able to contribute over $50,000 to local Gillette charities, and support numerous scholarships and programs in the community. We are having fewer tickets available this year so get yours before they are sold out! The main ticket has been reduced to $250 and gets you dinner for two and into the grand prize raffle of $20,000, 2nd prize of $5,000 or 3rd prize of $1,000 . Also, every 40th ticket drawn will receive $40. The Big 50 raffle is an additional $100 for a chance at $5,000! So for a combined ticket price of $350 you could potentially win $25,000! Tickets go on sale in February and can be purchased from local Rotarian's or by stopping by Land Surveying Incorporated. We look forward to seeing you there! Thanks for your support. 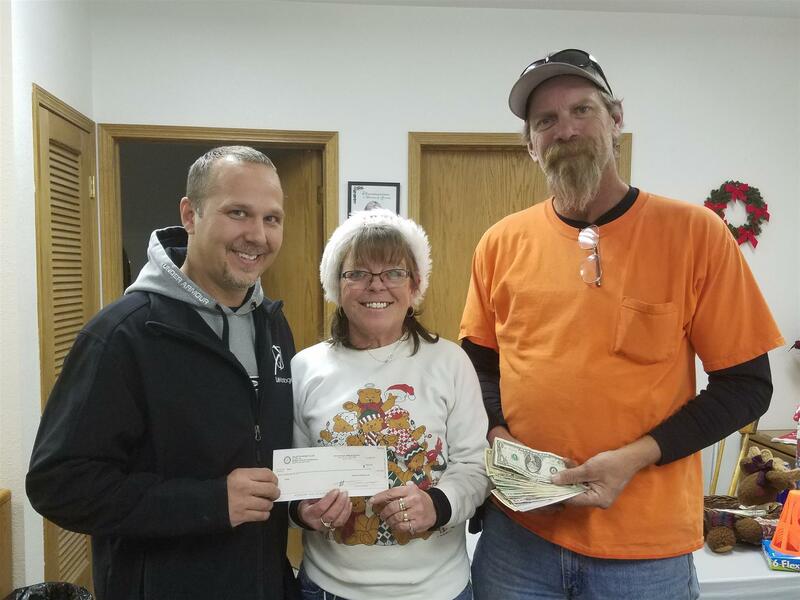 T his Year in a Time of Hardship and Need the Gillette Evening Rotary Donated through Club Member Donations and Club Match, $1800 towards the NE Wyoming ABATE TOY STORE, so that children and teens in need throughout NE Wyoming would have some small bit of Christmas this year. The ABATE TOY Store which is ran through volunteers did an amazing job partnering to help Children in need have a Christmas to Enjoy! 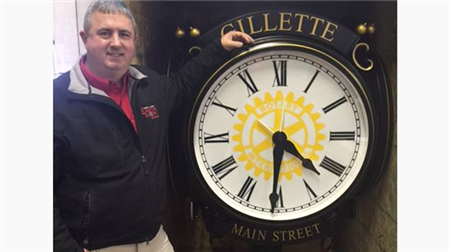 Tyler Miller 2016 Community Project was the Clock Tower that partnered with local city and Main Street to get a permanent Clock Tower on Historic Main Street. This project was funded by joint efforts and Members who donated were able to have their names or organization permanently attached to the base of the clock. Great Job Tyler and All Rotarians who assisted in this project. 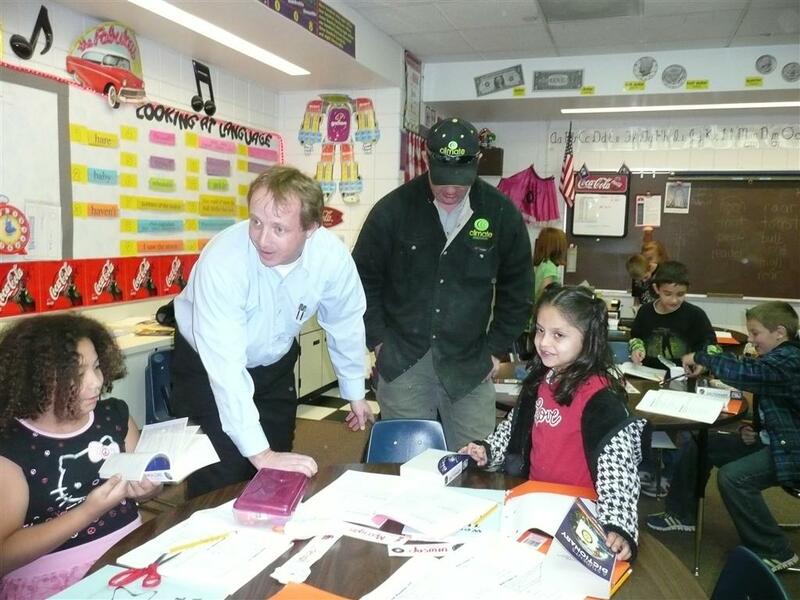 Meadowlark Elementary School. The first thing the students did was to write their names in their new books. 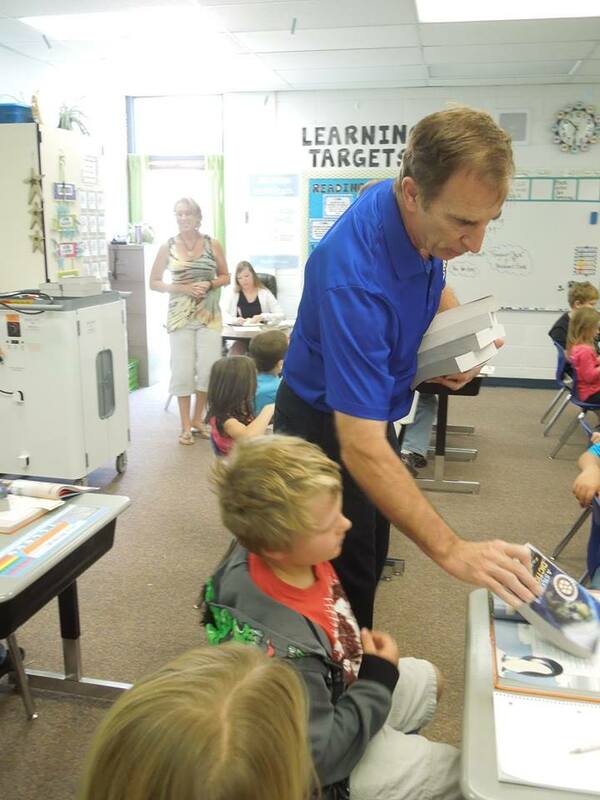 Each Gillette Rotary is the catalyst for delivering dictionaries to all of Campbell Counties third graders. 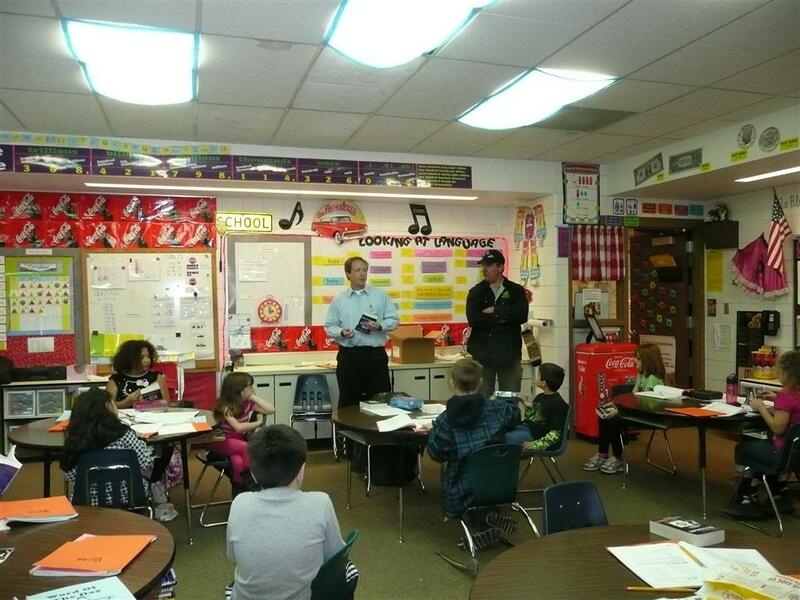 Here Nate Kintz of Gillette Rotary is joined by Energy Rotary's Chris Shelledy at Sunflower Elementary!